The Hilton Honors Aspire Card from American Express currently has an Informr score of 9.1 out of 10. This score is based on our evaluation of 9 sources including reviews from users and the web's most trusted critics. Hilton Honors Aspire Card from American Express is typically available to those with excellent credit scores (650 or greater). For high-rollers who frequently visit Hilton hotels and put luxurious amounts of spend on their credit cards, the rewards and perks on the Hilton Aspire card are on par with the best elite cards. A $450 annual fee is quite a chunk of change, but you may find it’s a fair price for this premium card. If you’re a frequent traveler and a Hilton regular, you’ll like the rewards you’ll earn. And if you can use the card’s airline and hotel credits, the card will effectively pay for itself. On eligible purchases at participating hotel or resort within the Hilton Portfolio. On flights booked directly with airlines or amextravel.com and car rentals booked directly from select car rental companies. Enjoy one weekend night reward plus an additional night after you spend $60,000 on purchases on your Card in a calendar year. - Get up to $100 in credits for qualifying charges at participating hotels. The Hilton Aspire Card is a great premium card for Hilton loyalists. It can also be a great upgrading option for Hilton Ascend and Hilton Honors card-members who want more from their card. Diamond Status and the free nights are the highlights of this premium card. The Aspire Card is a great earner within the bonus categories. It can possibly be a long-term keeper card if you earn enough points and take advantage of its benefits. 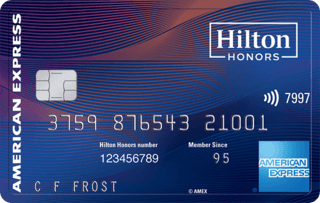 The Hilton Aspire is an excellent release for American Express and a top card for Hilton fans featuring an impressive list of benefits which we're sure will be a hit with points and miles fans. For regular Hilton guests that won’t clock up the stays/nights required for top-tier status, the card essentially lets you buy Diamond Elite status for $450. And that's before taking any other benefits into account. If you’re playing with the idea of getting a new travel credit card, don’t discount the new Hilton Aspire Card from American Express. Not only does it offer a large signup bonus, but it offers many of the benefits you can find with other top travel credit cards. We believe this card is a good fit for those who are loyal to the Hilton brand and want a card that can produce excellent rewards throughout the year. The card is an even better fit if you make a habit of staying at Hilton Resort properties when you vacation because you can take full advantage of the $250 credit. That is an insane return on value, at least $437.50 in profit each year. Most premium cards, like the Chase Sapphire Reserve or the American Express Platinum, struggle to give you break even value for the annual fee. This card PAYS YOU to keep it. The first year is even more profitable since you get the airline incidental fee twice. It's a fantastic choice for high-spenders who find themselves staying at Hilton hotels multiple times throughout the year. The Hilton Honors American Express Aspire Card comes with enough perks and benefits to balance out its high annual fee.